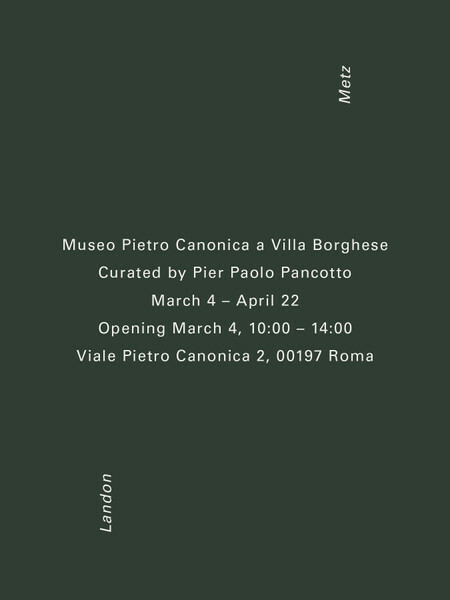 Andersen’s is delighted to announce Landon Metz’s first Museum Exhibition at Museo Pietro Canonica in Rome, presenting a new series of sculptural works, video installations and paintings specifically designed for the show. The exhibition seeks to create a dialogue between the international contemporary art world and Italy, offering visitors the unique opportunity to engage and appreciate the practice of artists whose work is rarely represented in Italian public institutions. Landon Metz conceived a project inspired by the cultural context of Museo Canonica in a symbiotic relationship with the architectural and historical characteristics of the institution. The common denominator is a reflection on sculpture and the direction that the practice is moving in today. In this regard, the artist presents a series of sculptural works in pigmented concrete that compliment, with three-dimensional shapes, his wall paintings, connecting the two expressive forms that mostly nourish his creative language. In a variety of formations, the sculptures populate the Museum’s spaces and resonate with the paintings by which Metz is best known, thereby building an ongoing dialogue between the seriality of the pigmented surfaces, the attributes of the location and the viewer, with a site-responsive sensitivity. Through performative and sculptural approaches, the exhibition activates a visual and limitless narration of the space extending the experience beyond physically perceptive boundaries.